Building upon the Global Clean-up Project (which was inaugurated in 2003, for Louix’s birthday), Grace in Action has expanded to incorporate an ongoing fruit tree planting project—Forests of Fruit. 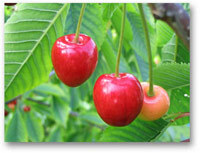 By planting fruit trees on public and private lands everywhere, and encouraging others to do the same, we align with Louix’s teachings that we are divinely designed to eat fruit, and that fruit is paramount to our health and vitality. Through this project, we provide food for people (as well as the animal kingdom) and help to bring an end to deaths from starvation and malnutrition, which claim millions of lives every year. The project also serves to help reforest, oxygenate, and beautify the earth. Louix emphasizes the importance of spending time on the earth for our healing and upliftment. 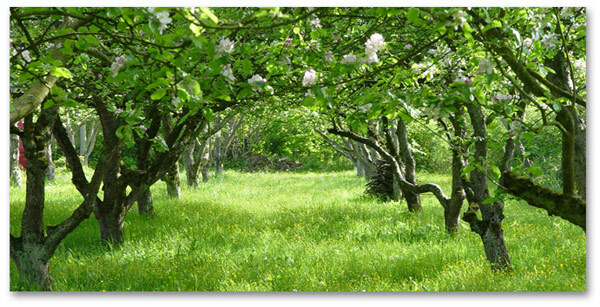 By planting and tending fruit trees, we will be in Nature and more open to communion with Mother Earth and nature spirits. There is a wonderful opportunity here to learn about and practice organic gardening and plant care, and to find ways to be in harmony and balance with the natural world. 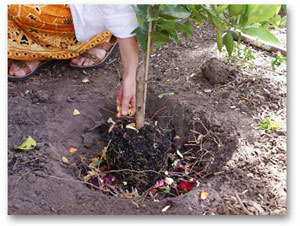 It is recommended that you conduct research before you select and plant trees for this project. Use the Internet, read relevant books and magazines about organic gardening, and speak with your local nursery. You will need to know what varieties grow best in your climate, and how to grow and care for the tree organically--without using pesticides or chemicals. You need to ensure the tree will be adequately nurtured and cared for, not left to die, or you will be creating a negative effect in the Universe--more ill health, more starvation, and further deforestation. As part of the tree selection and planting process, it is important to ask Mother Earth what variety or varieties She would like to receive, and where the trees should be planted. 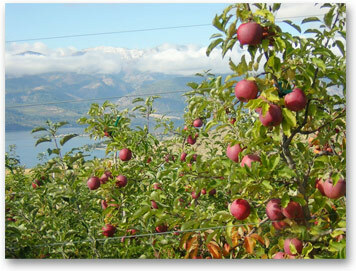 Louix recommends that we select heritage or heirloom varieties of fruit trees if possible (with the understanding that ones should gratefully accept fruit trees which are often donated by nurseries or other benefactors, provided they can grow in the climate wherein you would be planting them), and to avoid varieties which have been genetically modified, genetically engineered, bio-engineered, or are transgenic. 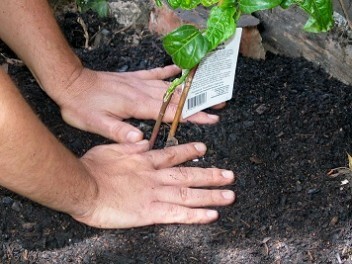 Once you have asked for and received permission from Mother Earth (and obviously from the owners, managers, and/or caretakers of each chosen site) to plant a fruit tree or trees, spoken with your local nursery and/or heritage tree expert about what the tree needs to flourish (adequate space to grow; proper variety for your climate; complementary tree, if the one you selected is not self-pollinating; water, sunlight, and soil; mulch and fertilizer; pruning; protection from winds, frosts, birds, insects), and, finally, purchased your tree/s (after asking God which trees from the selection at the nursery are the ones for you to take home), then you are ready to plant! Bless every one and every thing all the time. Please remember to treat the tree planting as a sacred act. Bless the soil as you dig the hole, bless the ingredients you add to the soil to enrich it, and bless the creatures (insects, worms, etc.) you find during the process. In your prayers, you can bless the earth, the tree, and the elements, and send a prayer into the Universe so that the tree will flourish and be bountiful, and its fruit will feed many people, all of whom will be blessed by the inherent health-giving, life-sustaining properties of fruit; and that the tree will restore the natural beauty of the planet and give us clean air to breathe. Bless the tree each time you water, feed, or care for it in any way. Talk to it—love it. And teach others to do the same. Remember: trees are conscious beings, too! you have had by participating in this project.